As long as I lived in Germany I never really got to appreciate Indian food. The Indian restaurants that I had been to always had this cheap, dusty, Made-To-Suit-Europeans charme. Only here in Dubai (where more than half of the population is Indian) I tasted real Indian food and loved it ever since. When I go to the supermarkets, my (German) eyes still fall out when I go past the shelves with the spices. Most of the stuff I had never seen in my life before. The packets are so big that I always wondered what it is being used for in such amounts, e.g. 250g of ground coriander or cumin or half a kilo of cardamom. I almost bow before these spices. Because I wish nothing more than being able to use them. Anyway, the other day I got all the required spices and I dared to make Biryani!!!!! The smell in the house alone was already worth my Indian cooking experiment. In fact, the Biryani turned out really well. There seems to be hundreds ways of preparing the rice and the gravy. This one seemed pretty easy and straightforward. That's why I want to share it with you. It's a good dish to prepare in advance. In fact, I prepared rice and vegetables in the morning and layered them into the baking dish which I then kept in the fridge until dinner time and put it straight into the oven. In a bowl add yogurt, ginger, green chili, salt, turmeric, chili powder - mix it well. Add all the vegetables (cauliflower, beans, bell pepper, carrots) the paneer and cashew nuts to the yoghurt. Mix it well then let it marinate for 10 to 15 minutes. Blend raw tomatoes to make a puree. Heat the oil in a saucepan. Test the heat by adding one cumin seed to the oil; if seed cracks right away oil is ready. Add cumin seeds. After the cumin seeds crack, add the tomato puree, and cook on medium-high heat. Cook until tomato mixture starts leaving oil and reduces to about half the volume. Add the marinated vegetables to tomato puree. Let it cook covered for 10 to 12 minutes on medium heat until vegetables are tender but not mushy. Stir the vegetables in between so they cook evenly. Wash rice gently changing water several times until the water appears clear. For fluffier rice, the rice should be soaked for at least 15 minutes prior to cooking. Drain the rice and put it into the saucepan. Add water, oil, and salt, and bring to a boil. Once the water is boiling reduce the heat to low and cover the pan. Cook until the rice is tender and the water has evaporated. Turn off the heat and fluff the rice with a fork. For a few minutes soak saffron in warm milk then gently fold the milk into the cooked rice. Preheat the oven to 180 degrees Celsius. Put half of the cooked vegetables into a baking dish 9″ x 9″ (20x20cm). Spread half of the cooked rice over vegetables. Over the rice, sprinkle mint and 1 tablespoon garam masala. Pour the remaining vegetables evenly over the rice. 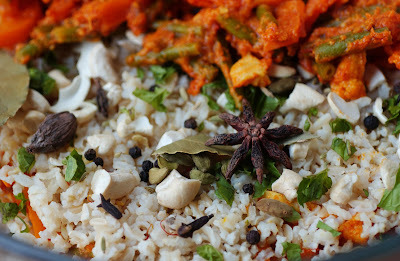 Spread remaining rice evenly over vegetables and garnish with whole garam masala. Next sprinkle sliced almonds evenly over the rice, and then spread melted butter over the entire dish. Cover the pan and bake for about 30 minutes. Serve with Mint Raita (plain yogurt mixed with salt, black pepper, and dry mint).